I always ask what I can bring, and if dinner is on a weeknight, Warren will let me know what they could use in order to make the night less hectic when they arrive home from work. This time it was a salad. Their dinners are always amazing, and this one was no exception. They served cheese they had brought home with them from a recent trip to Amsterdam. Then we had the salad which was followed by the most amazing marinated and grilled lamb chops with mashed cauliflower topped with reduced balsamic vinegar. All of this was followed by their other guest, Larry’s frozen lime pie with ginger graham cracker crust-perfectly light for a summer dinner. I’ve made the cauliflower before and will take a picture and send the recipe the next time I serve it. This salad was good, basic and had a bit of a twist with the pickled beets, which I know The Gwarren Experience enjoys. I would have also added walnuts but wasn’t sure if everyone would have liked them. Something to add if you’d like to try it. Mix the romaine with the carrots, cabbage and onion. 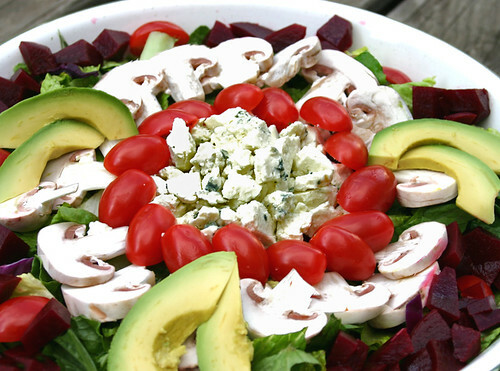 Place other ingredients on top of salad decoratively (or not). (Asian, Blue Cheese and Vadalia Onion dressings are all good). I love the stories that go with these dishes! I can’t wait for the Mashed Cauliflower with Reduced Balsamic Vinegar! So glad Carolyn’s not moving out or where’d we ever get a Gwarren story!? I love avocado & blue cheese so I am going to try this. Great – let us know what you think.